I'm going to start off by stating that I don't think Bernanke is going to "get away" with the insane monetary policy he's chosen. Printing trillions of dollars, cutting rates to zero, trying to manipulate the bond market and generally tampering with the natural market forces is going to have consequences. There is a price that will have to be paid for this madness. Just like there was a price we had to pay for Greenspan's reckless attempt to avoid a recession when the tech bubble burst. Greenspan certainly bought some time and a brief period of illusionary prosperity. But he did it by creating a housing and credit bubble. When those burst, as all bubbles do, the fallout was much worse than if we had just weathered the recession to begin with. Ultimately all of Greenspan's and Bernanke's efforts have just loaded the nation with a monstrous debt burden that we will never be able to repay and soaring unemployment that isn't going away anytime soon. Now I’m afraid Bernanke has probably let the inflation genie out of the bottle with his reckless actions. That means surging commodity prices. The fact that almost all commodities resisted the stock market decline on Friday is an ominous warning sign. 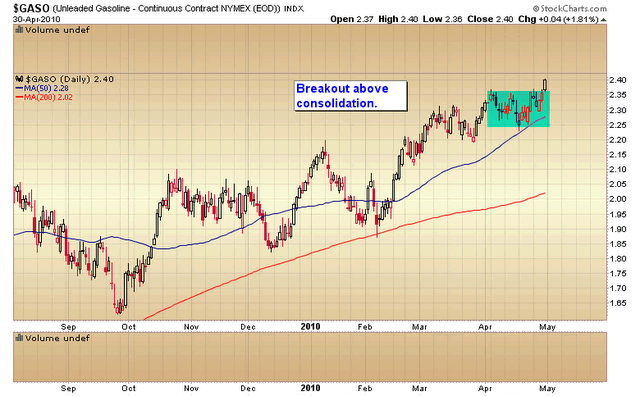 Both heating oil and gasoline broke out of recent consolidations on Friday despite huge selling pressure coming off the stock market. 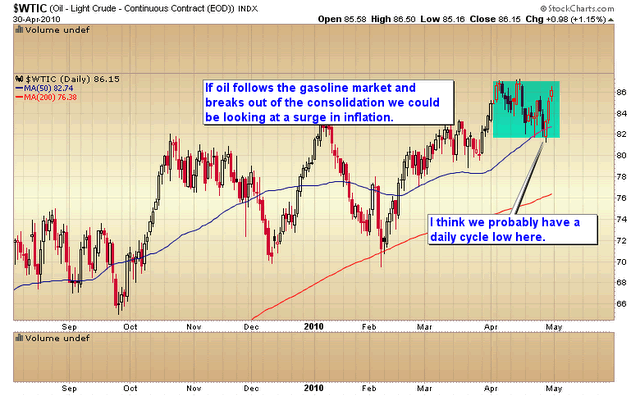 It now looks like we've probably seen the cycle low in oil. 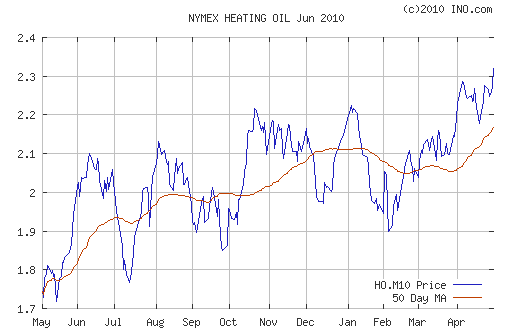 If oil follows the gasoline and heating oil markets to new highs (and I think it will) I'm afraid we are going to get a strong surge higher. And if we did just see the cycle low a few days ago this push could last some time as the average cycle in oil has been running roughly 50 days trough to trough. 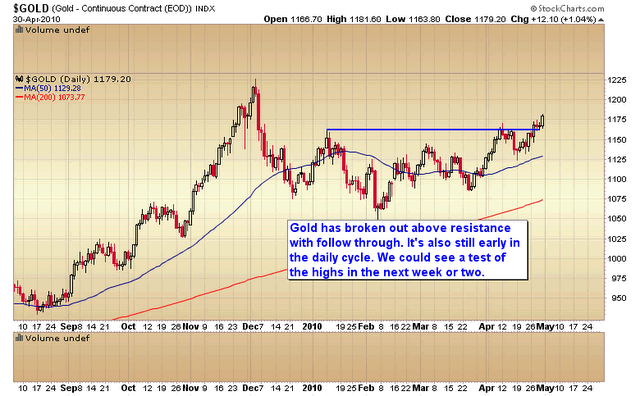 Gold has also broken above the recent resistance level with follow through this time. Gold is also early in its daily cycle so we could see a strong push higher here also. I'm expecting gold to at least test the highs during this minor cycle advance. And I'm leaning fairly strongly in the direction of a C-wave continuation for the reasons I outlined in the weekend report for subscribers. Keep in mind that all this is progressing despite a strong dollar. Of course that is just an illusion. It really isn't possible to print trillions of dollars out of thin air and have a strong currency. The dollar just appears strong because the currencies it's measured against are exceptionally weak right now. The relentless rise in most commodity prices reveals the truth about the dollars value. We are now on the verge of a surge (maybe a huge spike) in inflation. I think Bernanke is about to get served notice that he didn't fix anything. All he did was create a much bigger problem. Unfortunately you and I are the ones that are going to pay for his mistakes with higher taxes and much higher inflation. A financial blog with emphasis on the gold bull market.